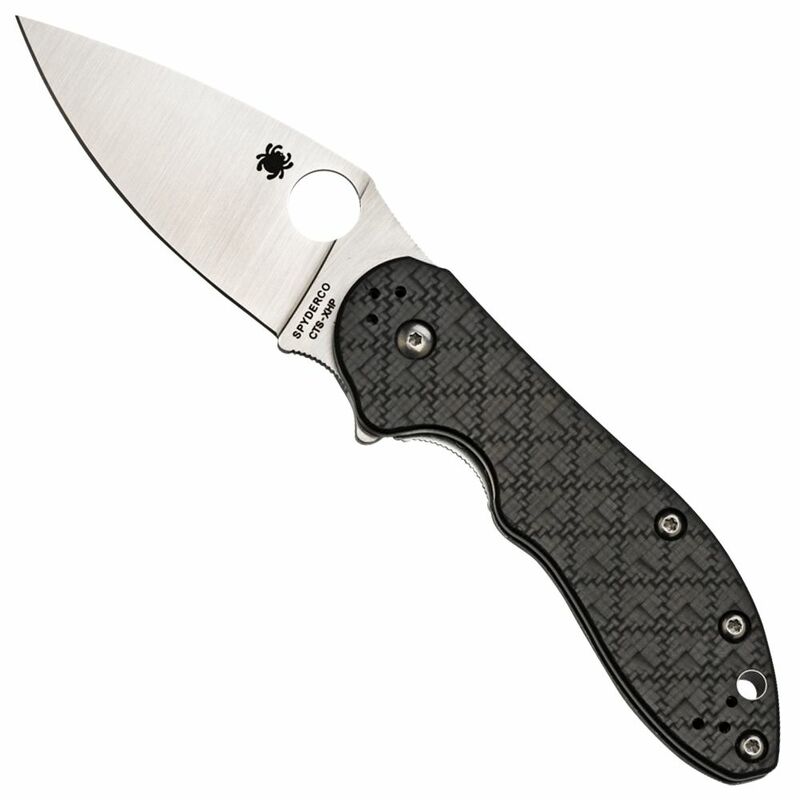 One of Spyderco's guiding principles is ”No more than necessary; no less than perfect.” Our Domino folding knife is a shining example of this concept, combining an understated, but highly efficient ”flipper” with the advanced ergonomics and high-performance cutting capability that make Spyderco knives unique. Designed by Eric Glesser, this performance-driven knife is our second model to feature a flipper (the first was the Southard Folder). Originally developed by custom knifemaker Kit Carson, a flipper is a small integral tab that extends from the edge side of the blade's tang. When the knife is closed, it protrudes slightly from the back of the handle, where a slight pull of the index finger provides leverage to overcome the blade detent and rotate the blade into the open position. The Domino's flipper is a minimalist design that does not interfere with the knife's refined ergonomics or prevent it from being opened via the blade's Trademark Round Hole. It is perfectly positioned to offer optimal leverage and is supported by special ball-bearing washers in the pivot that reduce friction to guarantee a smooth, reliable opening. In the open position, the flipper practically disappears into the grip-friendly contours of the handle. Precision machined from CTS XHP stainless steel, the Domino's blade features a full-flat grind for superior edge geometry and a distal taper that ensures an acute point. It is mated to a handle that consists of a solid titanium scale on one side and a titanium liner and carbon fiber/G-10 laminate scale on the other. The solid titanium scale forms the foundation of the Domino's sturdy Reeve Integral Lock (R.I.L. ), which features a hardened steel interface that ensures a long service life and doubles as an overtravel stop for the lock. On the other side of the handle the Cubic Check carbon fiber/G-10 laminate scale boasts an intricate geometric pattern that is both visually stunning and provides an enhanced grip texture. Designed to be carried and used, the Domino has a slim, pocket-friendly profile and an open-backed construction that reduces weight and allows easy cleaning. The Domino also boasts a four-position pocket clip-a unique feature for a flipper-style knife-that allows tip-up or tip-down carry on both the left and right sides of the body. Its long textured thumb ramp and forefinger choil (finger groove) comfortably support a wide range of grip options and ensure positive control during use. The Domino is a vivid reflection of Spyderco's design philosophy that integrates all the defining characteristics of our approach to knifemaking into a uniquely functional cutting tool. We're confident that you'll be as excited about it as we are.